It's no secret that I love buttons. Especially vintage buttons. 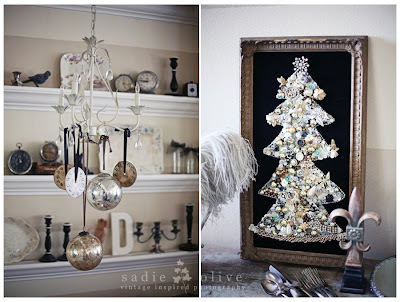 So you can imagine the little squeal I let out when I saw this pretty button tree made by Sara of Sadie Olive. Hope your move is going well! Merry Christmas! Love these buttons trees. They are similar to the old jewelry trees they use to make. Check out the tour of my friend's home at: atticgals.blogspot.com. She has a jewelry tree from her grandma and guess what? They inherited the one from her husband's grandma? Is that fun or what? Anyhow, another idea. Love your blog! I too have a growing list of Christmas projects. I had better get started now tho. It will take me at least until then to get them all finished. yup..i love it as well. i got your card..so cute.. I hope your Christmas is perfection and i can't wait to see you next week!!!!!! My grandma made one of those trees years ago. It was pretty awesome! i love that button tree! This post was Awesome! !That button tree reminded me of my grandma!! She has one made from old vintage brooches..I havent seen it in years...thanks for the reminder it warmed my heart..love ya gram! I'm inviting you all to see my Gingerbread House at 58 Gingerbread Lane. I'm squealing too! Love it!!!! So beautiful! I love it, love it, love it. I too have a thing for buttons :-). Merry Christmas to you - hope you have a wonderful holiday! I can't believe you're blogging in the middle of moving! Wow, that's impressive. I hope you're wherever the new home is in time for Christmas! I love your dried oranges idea, I already did that with apples and I think I'm going to do some oranges today. I used the apples to decorate our "outdoor tree" out on my porch. We got really into porch decorating this year! I was going to link it to your frugal linky post but it was closed, bummer! That's what I get for doing things last minute, next year I need to get organized and do stuff earlier. Anyway, hope you have a great Christmas, your blog is one of my faves!